Ray Moxley has just brought his newly built 40′ revolutionary catamaran RA into Cowes from Plymouth where it was recently launched. Not only has Ray drawn every inch of this remarkable boat and overseen its construction, but he will also be celebrating his 90th birthday just three weeks after this, its maiden race on Saturday. The Race organisers at the Island Sailing Club are fairly sure that he is the oldest competitor in this year’s Race, and possibly in the history of the event. Ray, the Architect who designed London’s Chelsea Harbour, has been working on catamaran designs for over fifty years. He has employed his architectural skills to produce a fast, comfortable boat with a striking modern interior. It is on deck however that it truly innovative. RA has two masts side by side (rather than one behind the other). The aerodynamic advantage is similar to that found in bi-planes. Ray is looking forward to the Round the Island Race, saying: “I am really pleased with the performance of RA. It is better than we had even predicted. We hope to be raising interest in the design so that we can kick-start series production in our yard in Cornwall.” The crew for the Round the Island Race will include Ray’s wife and co-owner Ann and a number of children, including Son Mike the skipper, and grandchildren. For the sailing buffs RA is a lateral schooner with wrap-around sails on carbon masts without shrouds or spreaders. She is a blue water cruiser with a displacement of about 8.5 tonnes. Length 12m, Beam 5.5m. Eight times British champion Emily finished 17th in this year’s Freestyle Skiing World Championships and is currently the only British Ski Cross athlete who meets the BOA selection criteria for the 2014 Olympic Winter Games in Russia. In 2010 she achieved the best result for a British female skier, finishing 11th in the Ski Cross World Cup Finals in Italy and made history by being the first British female to win a Europa cup event. Based in Shamrock Quay Marina, Southampton, SkiWeekends.com is supporting Emily in her mission to secure a place at the Winter Olympics in Sochi next spring by sponsoring her for the 2013/14 season. 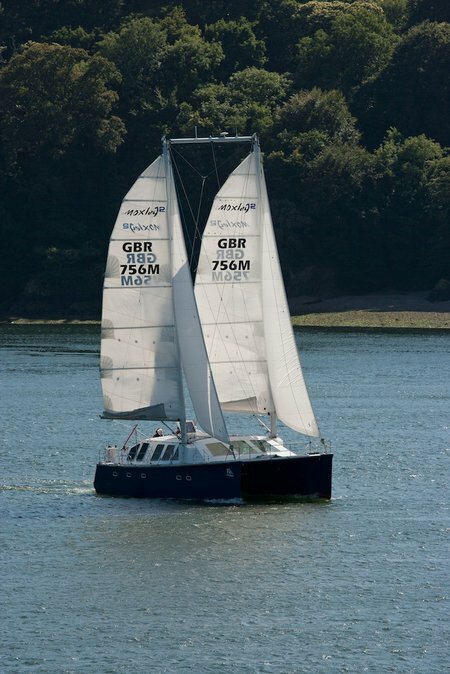 The company is also sponsoring the yacht previously named Edith (GBR6831T) and for this Race entered as SkiWeekends.com. The IRC-optimised Elan 333 enjoyed a triple whammy last year by winning the Solo Offshore Racing Clubs Solent series, the Royal Southampton YC Double Handed series and the Royal Lymington YC Thursday night series. We recently wrote about Collective Spirit, the Boat Project, that is racing on Saturday, skippered by the Boat Project’s Technical Manager, Mark Covell who is keen to keep the yacht afloat and sailing under charter. She has an ongoing life as a work of art but not as a working sailing craft, unless the team can create an income from her on the water. We should also have pointed out that Lone Twin is the company that is the custodian and developer of the boat and Gary Winters and Gregg Whelan are the originators of the idea for the Boat Project which formed part of Artists Taking the Lead, a series of 12 public art commissions across the UK to celebrate the London 2012 Cultural Olympiad. The Boat Project was the winning commission for the South East region and was funded by Arts Council England. This Fractional Sloop was built by Harry King & Sons in Pin Mill, Suffolk in 1957 to an Alan Buchanan design. Now operated for charter, she is a regular at classic events in the UK and abroad. Marcita’s first owner took her from Pin Mill up to Yorkshire, berthing her in Bridlington as a member of the Royal Yorkshire YC. Her second owner, Mr Vickers, bought her in 1963 from Moody’s in Bursledon on the Hamble. She was sailed on the Solent until 1970 when he moved to Brantham so she was moved to the Orwell. One of her first outings from the Hamble ended dramatically thanks to a poorly fitted forestay which came away as she tacked, bringing the mast down off Lee-on-Solent with an onshore wind. The owners two sons were lifted from her by helicopter and taken back to Warsash where they had friends at the sailing club. That escapade made a couple of lines in the Daily Mail! This all-Russian entry of first timers to the Round the Island Race are campaigning an Archambault A40 named Knyaz. The boat is raced with an international crew onboard originating from five countries. The RTI is the beginning of their yacht’s pan-European tour this year that includes a Fastnet Race campaign and some major inshore regattas in Germany, France, England and the Rolex Middle Sea Race in Malta. We wish them and all of our 1459 entries ?????! The Race Blog, providing up to the minute commentary from the race course, will go live on the Race website at 0445 on Saturday. In addition, this year the Race communications team will be posting a ‘News on the Hour’ bulletin throughout the day.